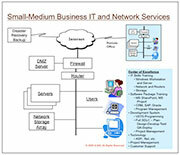 The Business Strategy and IT Alignment Service is a first step in determining any anomalies within the IT operations. The goals of this service are to determine IT operations performance strengths and weaknesses as demanded by the overall business strategic objectives. It also includes benchmarking and comparison with the industry standards to highlight areas of improvements. The key Business and IT performance indicators are measured and analyzed for any variations from requirements. This allows for evaluating possible strategies and corrective actions required to meet the business objectives. Center Of Excellence Solution Design and Development: G-ESI has a unique solution design, development and deployment model based on center of excellence. This is to ensure the highest quality end-to-end delivery of IT projects at the best possible value. All solution designs, development and testing is done in our controlled environment prior to delivery. Only the accredited and certified staff is deployed on client projects, thus minimizing unnecessary surprises and lowering costs of development through deployment. Portfolio Management and Project Management Office (PMO): Proven Project Management technologies to manage and control projects and implementing standard processes are a key to successful project delivery. G-ESI specializes in PMO setup and implementing network based project management technologies. Off-the-shelf partner products (Microsoft Project Server, HP Mercury Quality Center and Project Portfolio Management) as well as SaaS solutions are offered based on customer needs. 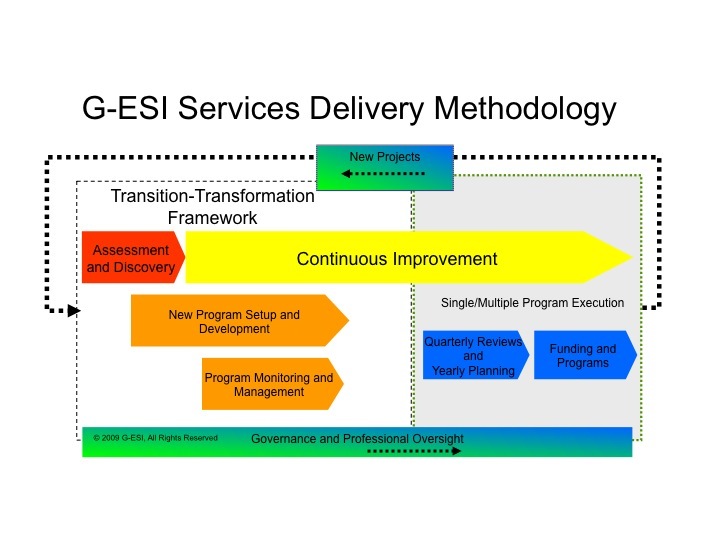 G-ESI differentiation is the end-to-end solution offering and implementation services at an SMB cost for a “Big Five” value.